I’m joining the Advisory Board of the Journal of Open Archaeology Data. flexible publishing model makes humanities journals affordable, and enables researchers around the world to find and access the information they need, without barriers. Ubiquity Press began publishing at University College London (UCL) and is now the largest open access publisher of UCL journals. JOAD aims at bridging the gap between standard publishing processes and the dissemination of open data on the Web, by following existing standards (such as DOI) and pushing altogether for a novel approach to the publication of datasets, based on data papers describing the methods used to obtain and create data, the way in which it is structured and its potential for re-use by others. As its name implies, JOAD is not a data repository: your dataset should be already deposited with one of the recommended repositories that will take care of its digital preservation. As with most open access journals, it’s the author(s) who pay for the costs involved in the publishing process, not the readers. JOAD aims at being a low-cost and effective way to disseminate your data to a wide audience, without the limitations and slowness of pre-existing publication venues. explanation, simplistic but not without sense. Copyright not applicable to geodata? There has been some rumor on the italian GFOSS mailing list, and also on many other forums about geodata copyright issues, after this exhaustive post by Jo Walsh. 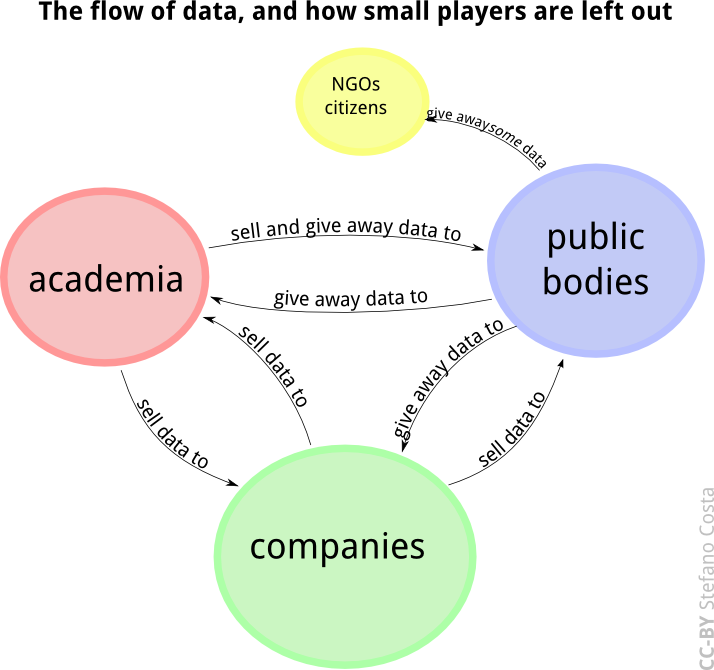 The issue is quite simple: many open geodata advocates have been thinking for months that a good compromise for public institutions that own public geodata would have been a Creative Commons-family license. First of all, let’s be clear about Creative Commons: just talking about CC means nothing, because you should always specify which kind of licensing you intend to use for your creation. Our last words, creation, introduce the major problem here. Geodata are mostly factual, because there’s no creativity in them. They just describe facts, geofacts if you like. People do not create data, they just put in digital shape something that exists. Or, if you prefer, there’s no creativity in geodata, opposed to music, poetry, photography… Creative Commons, yes. This could mean that public geodata could only go through public domain. I have no hope for European States to choose public domain for our geodata, that have been paid with our much-suffered taxes. GFOSS will try to convince administrators to follow this innovating way. Scritto il 18 Aprile 2007 10 Agosto 2011 Categorie GIS, Open KnowledgeTag geodata, Open DataLascia un commento su Copyright not applicable to geodata?